The hitch: A lot of black men aren't living at home and can’t look for jobs — because they’re behind bars. Though there are nearly 1.6 million Americans in state or federal prison, their absence is not accounted for in the figures that politicians and policymakers use to make decisions. As a result, we operate under a distorted picture of the nation's economic health. There's no simple way to estimate the impact of mass incarceration on the jobs market. But here's a simple thought experiment. Imagine how the white and black unemployment rates would change if all the people in prison were added to the unemployment rolls. For prime-age black men, though, the unemployment rate would jump from 11 percent to 19 percent. That's because a far higher fraction of black men — 7.7 percent, or 580,000 people — are institutionalized. “Imprisonment makes the disadvantaged literally invisible,” writes Harvard sociologist Bruce Western in his book, "Punishment and Inequality in America." Western was among the first scholars to argue that America has locked up so many people it needs to rethink how it measures the economy. The economic data sweeps these people under the rug, making the situation look far too optimistic for African-Americans. Western started writing about this problem in the early 2000s with Becky Pettit, a sociologist at the University of Texas, Austin. They’ve published reports in top journals, and have each authored books on the subject. One in nine black children has had a parent behind bars. One in thirteen black adults can't vote because of their criminal records. Discrimination on the job market deepens racial inequality. Not only does a criminal record make it harder to get hired, but studies find that a criminal record is more of a handicap for black men. Employers are willing to give people second chances, but less so if they're black. “Jim Crow and slavery were caste systems. So is our current system of mass incarceration,” wrote civil rights lawyer Michelle Alexander in her 2010 book "The New Jim Crow." These consequences entangle the broader economy. Yet, many people who study employment and the job market haven't been paying attention to the criminal justice system. That's a big mistake, according to Western. “From my point of view," he says, "mass incarceration is so deeply connected to American poverty and economic inequality." To see Western’s point, consider the statistics for people at high risk of arrest — young men (aged 20-34) who never finished high school. Let's set aside for a moment the unemployment rate, which is a blinkered measure of the economy. Only people who have recently looked for a job are considered unemployed. Instead, economists often focus on a different number, the fraction of people who have jobs. This is called the "employment-population ratio." Overall, about 60 percent of young white dropouts and 36 percent of young black dropouts were employed in 2014, according to the Census's Current Population Survey. But there's a caveat to that number. It excludes people in prison or otherwise institutionalized. The Census separately measures this population. According to that data, about 7.6 percent of these white men were institutionalized in 2014. (Overwhelmingly, this means jail, but it could also mean a mental hospital or a nursing home.) For black men, the fraction is so staggering, it seems like a typo — 29 percent of black male high-school dropouts between the ages of 20 and 34 were institutionalized in 2014. When you add in all of the incarcerated, the numbers become much bleaker and the racial gaps much wider. 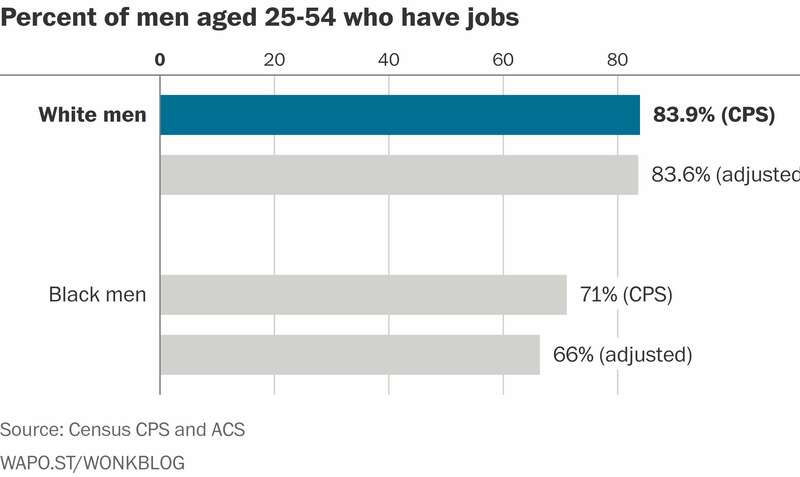 In reality, only about 54 percent of young white male high-school dropouts had jobs in 2014. And only 25 percent of their black counterparts were employed. 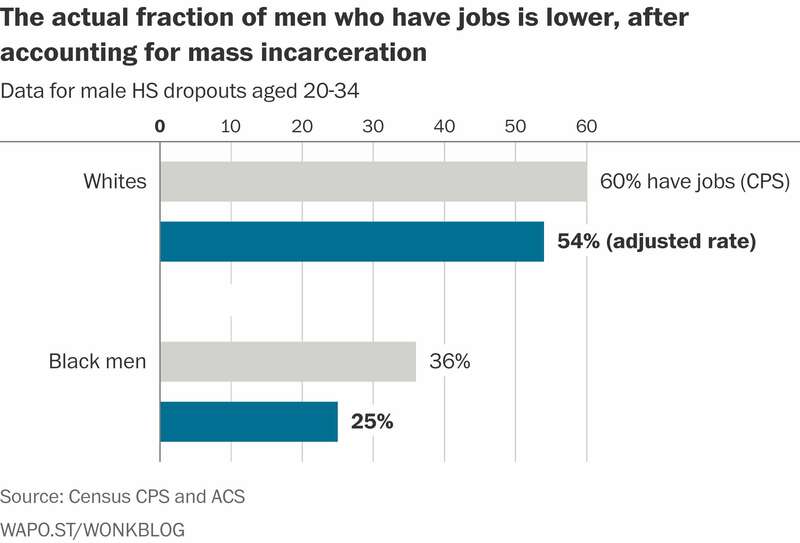 As the above numbers indicate, there are more young black male high school dropouts behind bars than have jobs. This is a very high-risk population. But even if we zoom out, the data still are skewed. Here are the same numbers for all prime-age men in 2014. Officially, 84 percent of white men between 25-54 were working in 2014, compared to 71 percent of black men. 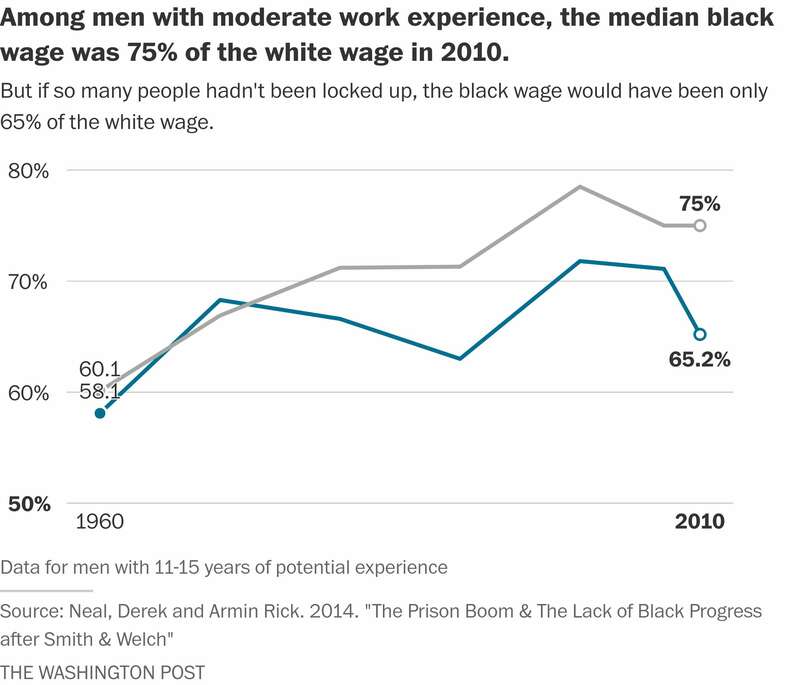 After including the incarcerated, the fraction of white men who have jobs hardly changes. But the black employment-population ratio drops to 66 percent. The prison boom has made such a dent that recently, social scientists have completely reconsidered how much progress the black community has made in recent decades. Derek Neal, an economist at The University of Chicago, and Armin Rick, an economist at Cornell, argue that mass incarceration has masked a lot of economic pain and a lot of inequality. Neal and Rick explored a slightly different thought experiment. What if all these men had never been arrested? What if they all had jobs? What if they were earning wages on par with similar men with similar levels of education? The effects are not all expected, or even necessarily positive. According to Neal and Rick’s calculations, if all these prisoners were actually working, they would drag down the median white wage by just a little, but it would drag down the median black wage by a lot, since so many black men are incarcerated. The chart below shows the hypothetical black-white wage gap compared to the actual black-white wage gap, among men who are 11-15 years out of school. The 1960s and 1970s yielded incredible economic progress for black Americans — dividends from civil rights reform. But the trend stalled in subsequent decades. Then, the financial crisis hit, wiping out much of those past gains. Neal and Rick find that in 2010, black men earned about 75 cents for every dollar white men out of prison made. 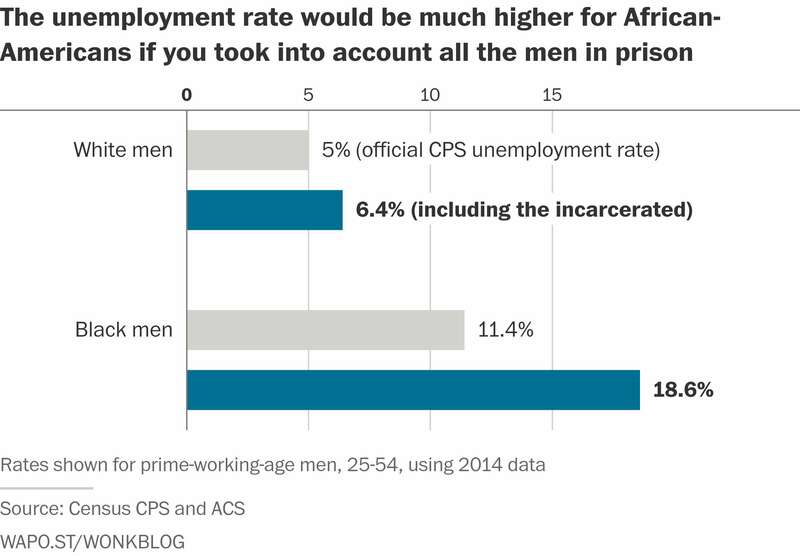 But if all the men in prison also had jobs, there would be a lot more inequality — black men would only be earning about 65 cents on the dollar. Had all these people been on the job market instead of in prison, they would have competed with other workers for jobs, driving wages down. Western and Pettit argue that the wages for low-skilled black workers in the 1990s rose in part because incarceration reduced the number of people competing for work. As incarceration rates slowly start to fall, there will be pressure on the economy to absorb some of the most hard-to-employ people in society. "Somehow we're going to have to figure out how to address the really severe employment problems of low-skill men," Western says. This will prove particularly difficult because mass incarceration's ill effects are concentrated in places already in distress. Researchers once estimated that, in some inner-city neighborhoods, up to one-fifth of the young black men are behind bars at any given moment. 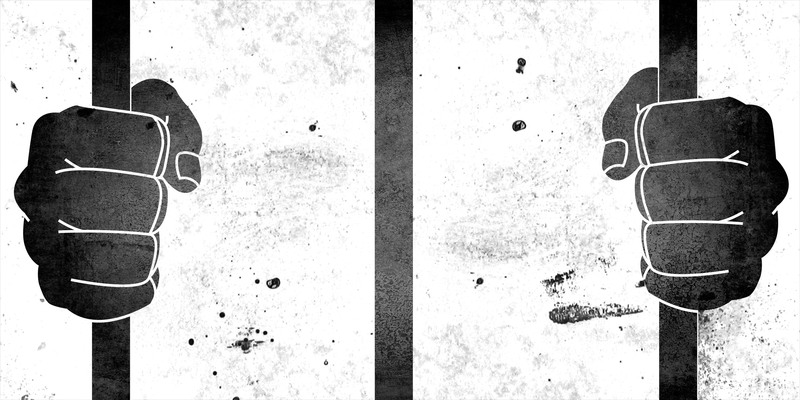 In their absence, their communities start to fracture. So when they get out, they find that there are no jobs and no support networks. "The impact of incarceration on communities and the impact of communities on reentry together create a pernicious cycle of decline," professors Jeffrey Morenoff and David Harding wrote in the Annual Review of Sociology in 2014. For now, there are still so many people behind bars that it continues to warp our sense of reality. Recently, politicians challenged Federal Reserve chair Janet Yellen to recognize the vast racial inequalities in the economy. They cited the black unemployment rate — twice the white unemployment rate. But however bad those numbers seem, the truth, after accounting for incarceration, is even worse. So perhaps the next time the jobs report comes out, there could be an extra chart to recognize the 1.6 million prisoners in America. They don’t show up anywhere in the government’s measurements of economic activity, but their absence is dearly felt. Jeff Guo was a reporter covering economics, domestic policy and everything empirical. He left The Washington Post in April 2017.